Includes a user manual where many toilets these days do not. 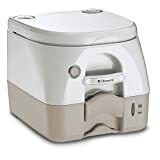 Known to be a great portable toilet for use in apartments and for the elderly. At 13.4 pounds it is a heavier unit than portable toilets with similar dimensions. Some people may not like the obvious location of the flushing spout just under the toilet seat. Lack of waste tank indicators is inconvenient. The waste tank does not have a rotating spout. A budget-worthy portable toilet with all the basic features you would want. Easy to use, easy to clean, easy to carry and with good tank capacity. Proven use in both indoor and outdoor environments makes this a very useful piece of equipment to own. Good value for the asking price. 50 flushes on average can be made from the 2-gallon freshwater tank. Compact making use, travel and storage easy. Its minimalistic design makes it easy to keep clean. The waste tank is separated from the bowl by a sliding valve, preventing splashback and spills. The valve is also double-layered further reducing any spillage. The unit has a strong carry handle for use when emptying, refilling and storing away. The portability of this toilet makes it useful for outdoor events and parties, camping, toilet training, for use by the elderly as well as camping and road tripping. Tank capacity: Waste tank – 5.3 gallons and fresh water tank 2 gallons. This is approximately 50 full flushes. 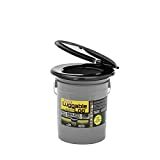 The Excelvan 5 gallon portable toilet is a budget option without missing out on many of the great features you would expect in a portable camping toilet. At 16.53″ high, it is a good height for adults, without being too high for children. The width of the toilet seat opening is 9.05″. It’s not a glamorous looking unit, but it’s built for functionality and effectiveness. It is still a compact-looking unit. The bowl is of a good size although men sometimes note it is not deep enough at the front. 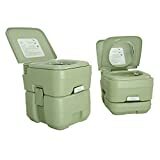 The unit is made from heavy grade polypropylene, ABS plastics and steel meaning that whilst compact, it is slightly heavier than other portable toilets. When flushed, the freshwater comes from a spout just under the toilet seat. It is quite obvious. Unlike other portable toilets, there are no waste tank level indicators on this unit. The toilet seat is not locked down. 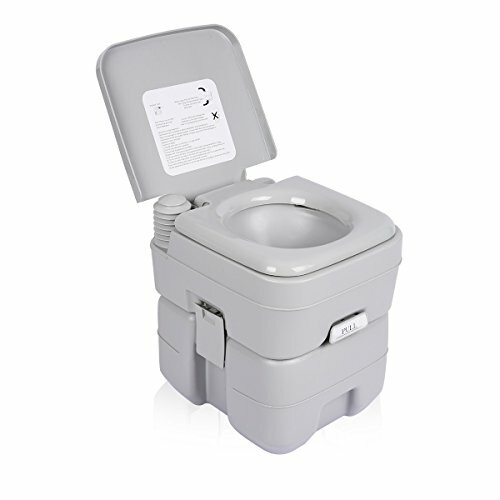 With a rounded design and lack of sharp corners, the toilet is easy to clean and keep clean.